Bur seriously, there are none so blind as those who won’t see. A genuine laugh out loud at that! Two birds with one stone. (One of the advantages of old age is that I can enjoy a joke just as much second time around). I am appalled at the money grubbing cynicism of the Burzynski Clinic. I can understand why celebrities will help with money-raising concerts, and ordinary people feel compelled to contribute to a fund that *could* save the life of a child. However, such acts simply help to keep these quacks (so sue me) in business. Pretty sad when parasitic frauds can silence criticism by threatening legal action. Let’s let them feel the full force on the Streisand effect. The Burzynski Clinic should be denounced by every blogger. Let ’em sue, if they can afford the legal fees. We don’t have to hire a lawyer to defend ourselves. They are heartless blood suckers. We have the right to say so. Loudly. As for the demented old fart exorcist, what can one say other than how the hell does he get any attention? Did the Catholic church really pay his bills and buy his dinners all those years? If that doesn’t prove they are in the wrong century, what possibly could? 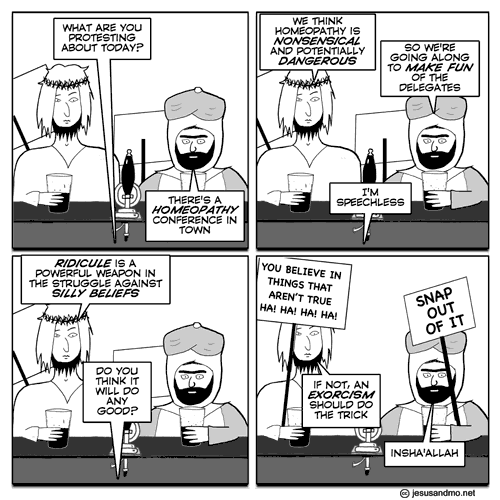 Just a niggle, but would Jesus and Mo really object to homeopathy? After all it’s closer to them then evil science based treatments. As usual it’s all about cash deals. What an awful pair of articles – one about an utter crook, and the other about an utter loon! 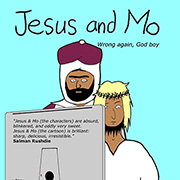 I don’t know if recovering from fairly big surgery (which, remember, was suppressed by the church for centuries because it involved messing with the will of their imaginary friend) makes me a bit more sensitive to rubbish, but I feel genuinely world-weary after reading them! Oh! The irony – it burns. what should you do if you believed both in homeopathy and critianism? @Unruly: you really don’t want a loser pays legal system! In Texas, we essentially have that (with so-called “tort reform”) and the way the conservatives structured the law, it discourages even valid lawsuits because the reward amounts plaintiffs can claim (especially in malpractice suits) aren’t enough for lawyers to take the cases. If you are in favour of Tort reform in America, you must read John Grisham’s “The Appeal”. You might change your mind. Someone needs to point out to the boys that it’s a homeopathy, not homo-pathy conference, maybe that would ease their minds? I see I’ve been beaten to it.